There are many kinds of treasures..
Don't let the amateurish cover image dissuade you from this inspirational romance from Nancy Herriman. Set in San Francisco in 1882 we are introduced to Sarah as she is coping with the loss of a close friend and benefactor. She is grateful for the inheritance that Josiah has left her, and has made plans with that money which goes towards securing her future as well as other young ladies. Unforeseen changes occur when Josiah's long-lost son, Daniel, shows up from Chicago to claim Josiah's purportedly hidden treasure of gold, along with claiming his rights as heir to Josiah's estate. Seedy sides of San Francisco lace the chilly atmosphere once the rumors of Josiah's treasure circulate and put Sarah in danger. 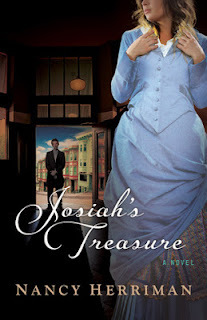 Readers watch the characters develop just as we are trying to find out both the history behind Josiah's reasons for abandoning his family and discerning the past that Sarah has tried so hard to erase. Daniel and Sarah are admirable characters each trying to make their futures brighter for others as well as themselves, but they each need Josiah's inheritance to achieve their goals. Herriman's story weaves an unpredictable suspense factor in with the light romance, and there is just a small thread of the usual faith questions threaded throughout, making Herriman's newest novel a gratifying reading experience. Read the first chapter of Josiah's Treasure here. TSS | Post Office Fun | What Are You Reading? Public Information Post regarding the FTC!! TSS | MAILBOX | HAPPY MOTHER'S DAY! TSS: May Flowers.. or freezing cold fronts..